« Waiting out the 7 line and Fulton St. while pondering 2nd Ave. While I was musing on the MTA’s capital construction credibility problem yesterday, the MTA decided to open a big-ticket project. At the Board committee meeting yesterday, the agency revealed that the Fulton St. Transit Center finally has an opening date. On Sunday, November 9, the politicians will gather for a largely undeserved photo op, and the building will open to commuters on Monday, November 10 at 5 a.m.
For MTA Capital Construction, this is a good moment. It’s only the second project, after the short-lived South Ferry station, that MTACC has opened, but like South Ferry, this one is a few months late due to some issues with the finishes and occupancy permit. 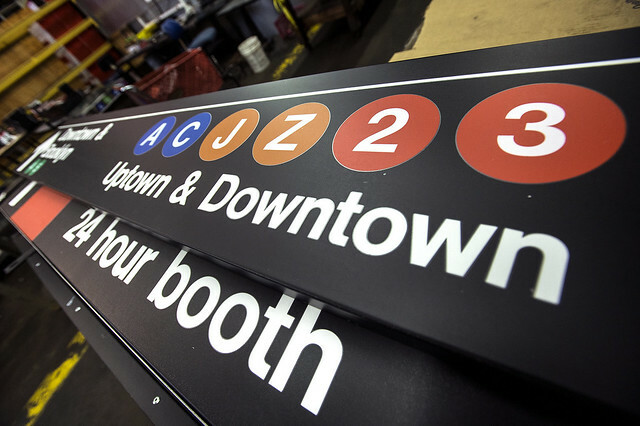 The MTA will also open the Dey St. Concourse early. The passageway, outside of fare control, provides an underground walkway between the Fulton St. subway complex and the R train’s Cortlandt St. station. It may one day connect to the E train and wasn’t supposed to open until the PATH Hub is finished next year. But after months of delays, the MTA is just opening the whole thing at once. So what are we getting for $1.4 billion? Well, most of the work we already see. The passageways and fancy LED screens are lit up; the hallways are as straight as they can be considering the layout; and everything just looks refreshed. But we’re also getting our headhouse, and for now, it’s simply the system’s fanciest Arts for Transit installation. Westfield is working to bring retail to the Transit Center, but no stores will be open on November 10 when politicians cut their ribbons. For now, the Transit Center is an empty building with lots of natural light and lots of empty space. But cynicism aside, opening the Fulton St. Transit Center is a big day for Lower Manhattan. Some construction will wrap, and a new building, promised as part of the post-9/11 rebuilding effort a decade ago, will reopen. Onward and upward. So those walking around Lower Manhattan can use it as part of a pedestrian network without paying for a subway ride. I wonder what percentage of people walking around Lower Manhattan don’t have an unlimited Metrocard. I guess all the people taking the PATH. So it’s a gift to New Jerseyites? Eh. I guess. What, no love for Westchester? I don’t think Westchester has gotten any new connections to NYC, or even any major improvements, since the opening of GCT in 1913. The corridor is fairly wide, but I know it was narrowed from the original plans, when the corridor was supposed to be inside fare control. I wonder if they had planned to split the corridor then, but apparently the narrower corridor that exists now is not ideal to be split into a fare controlled and uncontrolled section. So, after the Nov. 9 photo op, they’ll announce the next delay? They could at least get some pop-up stores in there for the holiday season. The parks are loaded with them. I had suggested turning the whole thing into New York’s haircut center, with 20 competing barbers. After all, that’s the activity I most associate with the subway. Pop up stores would make tremendous sense. They have them all over the City – like around Columbus Circle and in Grand Central during the holidays and it would be a good way to drive people into the new Center and could be used to bolster the asking prices for space in the Center. The New South Ferry station was already starting to look like crap before it was destroyed by Sandy due to both leaking and the lack of regular cleaning that the MTA somehow thinks is acceptable. Is there any reason to believe that Fulton Center and every other new station won’t also quickly fall into disrepair? After we’re done complaining about how MTACC can’t keep to schedule or budget, let’s not forget that the resulting product itself is usually garbage. Every working part will break and then it’s not maintained or even cleaned. It will age at a rate of 5 visual years per calendar year. Look at Sutphin Blvd Station on the E train or the peeling paint at 21st Queensbridge. It will not be in a “good state of repair” at the 5 year mark since by then it will look 25 years old to commuters. The stairs from main fare control down to the A/C mezzanine are already looking worn and dirty. Well, Fulton doesn’t have the water infiltration issues which South Ferry had. And there aren’t many moving parts. I used to live above Fulton Street, and still use it for work intermittently. Maybe I’m evaluating it prematurely, it hardly seems less confusing than it was in 2002. It does seem more spacious I guess. I agree. It’s definitely nicer and more spacious, but I never found it as confusing as most people made it out to be. I think it’s confusing for newcomers who never saw it before. The way you are directed to use one platform to get to another (e.g., go down to the A, up to the J/Z[/M when I lived there] or 4/5) is kind of unfortunate. I’m not sure that has even changed. The reason that the A/C platform must continue to be the only route between the 4/5 and 2/3 stations is that the station under Nassau St. (J/Z) is a double-decker station. Its upper level is one level below the street. That’s why there is no room for a passageway connecting the 2/3 with the 4/5. The J/Z is in the way. Yeah, wasn’t sure if the headhouse sort of alleviated that problem. The headhouse is on Broadway, so it’s too far from the problem to do anything for it. It doesn’t alleviate that problem. It’s supposed to simplify the 4/5 to A/C connections, though. And for the first time, the whole damn complex will be wheelchair-accessible. If you didn’t know which exact entrance to take, Fulton Street was really confusing with endless walks on the long ramps. These lines, originally BMT / IND / IRT ( right? ) were not meant to be connected, and it showed. I typically commute via the Cortlandt St R station. The Dey Street concourse I guess will be useful as a shelter while walking on rainy or cold days. A very moderate improvement. Does anyone know when the turnstiles at the southbound R platform at Cortlandt street R will reopen ( the part connected to the WTC ). I know that it won’t be until the work at that part of the WTC is finished but is there an estimate as to when this will be? I think you wrote “last” when you meant “next”. Or it was a Freudian slip. The Fulton Transit Center makes the entire complex of Fulton St subway stops much easier to find and use, and makes them all accessible to the disabled. It provides opportunities for retail integrated into the subway station. If you think that’s all worthless, maybe that’s just a function of your narrow-minded thinking. (Incidentally, the lack of empathy regarding physical and mental disabilities among subway fans has tended to be epidemic). Was it overpriced? Honestly, yes – MTA paid too much for the real estate and the price ballooned, with part of the price hike justified and part of it not justified. Considering what was there before any work began, the neighborhood is better off. This seems to be strictly an NYC thing. The attitude I’ve seen among Boston, Philly, Chicago, LA, or London (UK) fans of their urban rail systems has been entirely different and pretty good. Ben, am I missing something? 7 train extension also had a “photo op” followed by a half-decade delay. I am not sure the headline “this time they really mean it” matches what’s in your post. As of last night, 11/4, they still havent opened the escalator at the Fulton/Bway entrance. They have however dusted them off, as they had gotten dirty after months of being idle. I hope to high heaven they are holding off on turning them on, just so they can do it at the opening ceremony. That would be obscene.